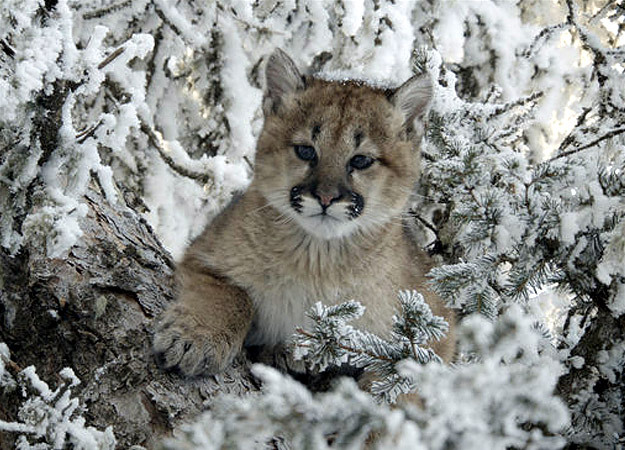 Mountain Lion Cub North America’s mountain lion is the most powerful jumper among the big cats. Its hind legs are proportionally the longest of any cat, giving it the ability to leap 18 feet (5.5 m) up the face of a cliff and execute a standing broad jump of 30 feet (9.1 m) or more. A stalk-and-ambush predator, the mountain lion hunts mainly at dawn and dusk. It can pounce on its prey so violently it sometimes drags its victims 20 feet (6.1 m) along the ground. The mountain lion has the largest natural distribution of any terrestrial mammal in the Western Hemisphere, and goes by various names across their range including cougar, puma and catamount. More closely related to domestic cats than lions, mountain lions are the only big cats that can purr.